Bonsai wiring is one of the most basic techniques that bonsai enthusiasts use to create a bonsai tree. Wiring helps to keep bended trunk or branch at a desired position and style. Without holding force from wire, tree trunk and branches will return to normal position once you stop bending and put your hand off. In this article, I’ll talk about suitable time to wire, and how to do wiring as well as useful relating tips to carry out this technique. Before we move on, you may want to read about bonsai wire as supplies first. Ready? Okay, here’re several main steps and tips about bonsai wiring. Perhaps, there’s no exact answer for that question because bonsai growers are located in many regions with many zones of climate and growing different types of bonsai trees. In general, however, it’s better to do in a temperate climate if possible. In any case, you should keep in mind several tips for choosing wiring time. Don’t wire in freezing weather. Wiring probably causes certain wounds, some of which may not be healed in extreme climate condition and result in dieback phenomenon. Tropical trees can be wired almost any time of the year because they don’t have dormant period. Wind the wire around the stem at a narrow angle at first, then at 45 degree angle upward. Coil bonsai wire around the main branch first, then secondary branches outward later. Bend the trunk and branches into desired position. There’re two directions, clockwise or counterclockwise. To beginners, there’s no big difference between these two and they choose either way that they feel convenient. Yet, it is not so correct when they get more experience. Usually, you should combine wiring with twisting the branches to some extent to get better effect. This specially true to relatively large branch or trunk, where only wiring and bending easily break the wood. Twisting also applies well with juniper species to get a look of more aged tree. To carry out such combination, wiring should be in correct direction. Otherwise, when you twitst, it sill automatically unwire the metal string, resulting less force to hold the tree in new direction. The rule is wind the wire the same direction with the direction you intend to twist the branch. In other word, if you plan to twist a branch clockwise, you should curve the wire the same direction and vice versa. Use both of your hand, wind the wire around the branches, not in lieu, otherwise you risk breaking the branches. Let the tree dry out a couple of days before wiring because a slightly dehydrated bonsai is more flexible and less likely to split or crack while being wired. After wiring, you should put your trees out of direct sunlight for a few days. And if possible, it’s better to keep them sheltered from wind for some weeks, while regularly water the foliage with daily sprinkling. Well, in that case you still have other alternatives. First, you can practices bending branches by anchoring tools. Second, use the method of clip and grow. The latter can give you beautiful styles, but takes you a lot of time and effort, as you have to nurture the shoots which grow to the preferred direction. What to do after wiring? Should we leave the wire there for good? No, you leave it until the branch can maintain at the repositioned place by itself (without needing wire any more). Then, you should remove the wire. In a different situation during the tree growing up, once the wire bites into the bark of the tree, you should also change the wire or re-wiring to avoid advserally affect to branch’s bark. It’s better to use wire cutter and remove bonsai wire by cutting it off rather than uncoiling it. Don’t try to save some wire because you’ll likely damage your tree while uncoil the wire. 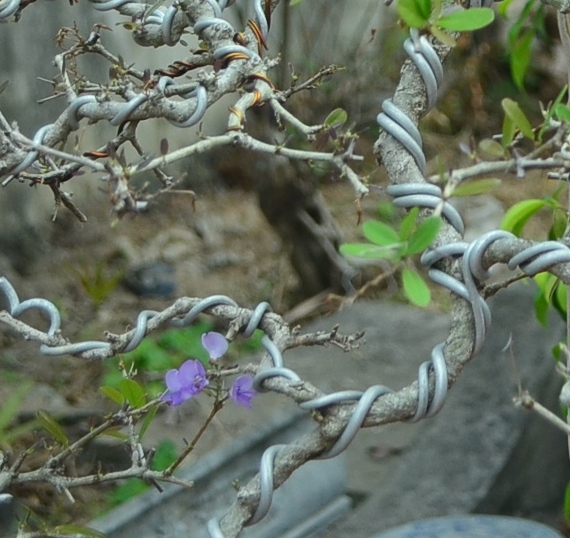 Above I talk about bonsai wiring as a basic skill, just do it and you’ll gain the know-how. I hope you’ll have a pretty looking tree after wiring process. For now, you may also want to learn more about other bonsai techniques or how to make an wire bonsai tree.